This blog is based on an ambitious idea: I will explore the cuisines of the world, from all of the six inhabited continents. Everything I make will be vegan, either because the original dish is vegan or because I adapt it to a vegan diet to the best of my ability (I will not e.g. replace meat with tofu, but I might use seitan). I will also try to make most of the recipes accessible to people following low carb, gluten-free or other special diets (although most of them probably won’t be raw friendly). This idea was entirely my own, conceived in September 2009, so if someone has already made a similar project I apologize for appearing to be a copycat. I’ll try to make the dishes as authentic as possible, but I might use ready-made ingredients like spice pastes, so that I do not have to buy every single spice in the world (I already own a very large repertoire of spices and I have a good access to ethnic groceries). I may also use recipes from generic vegan cookbooks, if I determine that they are reasonably authentic. I will try to explore every cuisine that has vegan dishes (recipes of which I’m able to find) or ones that can be adapted into vegan diet, with certain exceptions – I will skip a cuisine if all of the veganizable foods sound unappealing to me or require ingredients, equipment or methods of preparation that I cannot easily and affordably procure, or are extremely labour-intensive. With the aforementioned caveats I will attempt to try every cuisine once, either a single dish or a combination of dishes commonly served together. I will try to post a new blog entry about three times once a month (had to reduce the frequency after my pituitary was destroyed). I still want to be able to cook foods outside of this project. Obviously a “cuisine” is difficult to determine. A cuisine does not necessarily equal to a country, because some countries have very similar food traditions while others may house different cuisines (and others, like Jewish cuisine, are not geographically based). Nonetheless with countries that are often deemed to have dozens of cuisines (such as India or China) I will only try one or a few of them, simply to give other countries and areas a chance, too. It may not be fair, but life isn’t always fair. I assume the final list of cuisines will number about 150-200. Besides posting the recipes, photos and intros to cuisines, I may occasionally post other content, such as (cook)book reviews related to the project. If you want to send me a cookbook to review or to use as the basis of my dishes, email me and I’ll give you my address. It does not have to be a vegan or a completely vegetarian cookbook, if you think it would still be useful for my project or my readers. However, the book does have to pertain to the international theme. I will remove comments that are nothing but bashing of a certain country or ethnicity (bashing a cuisine is alright as long as it is done respectably and does not reek of disguised racism/nationalism/politics). I may also remove comments that discuss the ethics or nutritional aspects of veganism, because no matter how important, that’s off-topic here. You are free (and encouraged!) to suggest cuisines, dishes, recipes, books and links. Even vague suggestions like “there is a great Indonesian dish which contains tomatoes and the name begins with a g” are OK, as I can probably find the name of the dish. If I use your recipe, idea or suggestion you will get full credit. 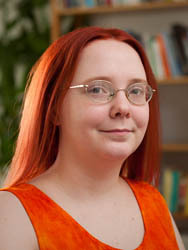 I am a 30-year old Finnish author, journalist and translator. I live with my picky omnivore husband (who loves broccoli, though) in Amsterdam, the Netherlands, where I relocated from Helsinki in 2010. I have written many different kinds of material from interior design articles to ad copy, from music reviews to a book about Twitter and three medical textbooks. Medicine and food (and the way they intersect in clinical nutrition) are my main interests. I contribute to the Finnish magazine Vegaia (though not as regularly as I used to) and I have also written about food/nutrition/health for several other Finnish magazines. My first novel Marian ilmestyskirja (Maria’s Book of Revelations) was published in October 2011 and it has been followed by three others. Veganism plays a moderate role in my third novel Häpeämätön (Shameless), which even features a vegan cupcake recipe. My fifth novel, out in January 2015, deals with animal intelligence/emotions as well as animal rights. I am also writing a short story on this topic (and would be interested in hearing about suitable media to publish it in!). I am working on a vegan food-related book, partly a cookbook (which is not about or related to Vegventures), on contract for a Finnish publisher. It was already supposed to be out in 2012, but due to severe sabotage of my health its release has unfortunately been delayed to late 2014/early 2015 and the project has expanded to include a collaborator who has authored several vegan cookbooks. This is my first real personal blog, however I have dabbled in paid blogging as early as 2004 when I worked for a computer magazine. My personal website (which some people erroneously call a “blog”, because apparently everything on the Internet must be a blog) dates back to 1997. Since launching this blog I have also started two blogs in Finnish. I turned vegetarian in 1999, which is also when I started studying clinical nutrition. I have always found Finnish cuisine bland and uninteresting, and like many Northern/Eastern European cuisines it is heavily based on “meat and potatoes”. Most people in Finland have probably never eaten such – for me and many other basic – foodstuffs like pumpkin, asparagus or chickpeas. My interest in ethnic food was sparked very early: I was five when I first tasted chai, Indian spiced tea. Immediately I realized that it had something I had never tasted in Finnish food. Indian cuisine still remains my favorite, but I’m also a big fan of Nepalese, Thai, Indonesian… Hopefully I will discover many new favorites along my Vegventure. Photography has been one of my favorite hobbies since 1996. When I got a DSLR and other “pro” equipment in 2007 I moved on to food photography. I have vegetarian recipe pages in both English and Finnish. My personal Twitter account is DiamonDie. Which camera and lens do you use? Which spices are featured in the header picture? It will be revealed later. It’s a free font called Delicious Heavy, with some extra kerning (spacing between the characters). Where does the slogan come from? From the scifi author Jules Verne who wrote Around the World in Eighty Days. Nowadays it’s more like around the world in 80 milliseconds! What are those “dl” things? Dl, short for deciliter, is 1/10th of a liter and a common measuring unit in countries using the metric system. Here in Europe many ingredients that Americans would measure by weight are measured by volume. Which countries have you actually visited? Unfortunately not that many because of my severe chronic illnesses. Finland, Sweden, Denmark, Norway, Estonia, the Netherlands, Germany, Belgium, Greece, England and Scotland, most of them multiple times. The country I’d most like to visit is India, but unfortunately that doesn’t seem likely in this life. Can I advertise here? Will you review my product? Can I interview you? Or will you write a guest post for my blog? Contact me for more information. Generally I don’t take guest posts for this blog (but may agree to write one for yours), but everything else may be considered if it’s topical. Any ideas are welcome! I have Africa and South America planned quite well (though of course I still welcome suggestions for those, too), but many parts of Asia are still question marks. What a fantastic idea for a blog! I love it! I work for a publisher of vegan books. For Asian vegan food I would recommend 2 books by vegan chef Chat Mingkwan: “Buddha’s Table” & “Vietnamese Fusion.” Chat has a new title about to be released called “Asian Fusion.” I would also like to recommend a book by Miyoku Schinner called “Japanese Cooking, Contemporary & Traditional” which has been very highly praised. We also publish “Authentic Chinese Cuisine” by Bryanna Clark Grogan, the the well-known vegan chef who also wrote “Nonna’s Italian Kitchen.” More information about these and our other books is available at http://www.bookpubco.com. Thank you for the suggestions, Rick! I’ve been supposed to get Authentic Chinese Cuisine, as I’m a big fan of Bryanna Clark Grogan. Hello, I am Roberta, an Italian student in Lecce (Salento – Italy), and I am working on a project concerning the Italian style food system (the Med-Italian Diet). May you please tell me your email address? I’d like to invite you to a food festival we are organizing in late may 2012. Thank you very much. My email address is maija@writeme.com, it’s listed three times on the page you just commented on. :-> Your food festival sounds interesting, but may be a bit far for me to attend since I live in the Netherlands. Maija, I just took a look at your blog after getting a tweet message and I have to say I’m absolutely in love with it! It’s very similar to what I’m doing with my http://www.heartofavagabond.com but yours is more focused in the cuisine and mine in different aspects, including local cuisine. I’m also thrilled to see such a beautiful project coming from another European girl, as it seems to me that most vegan and vegetarian info and blogs come from the US. Thank you! Your own blog looks very interesting too, more focused on travel… something I can only dream about doing because of my extremely poor health. Hy there! Maija, haven’t you thought of trying some Armenian specialities? I have Armenian origins, and I am very fond of ajlazan, diverse types of pilaff, kufteh, spice cake, filled eggplants and the like… Incredible that veg*anism has never had traditions in Armenia, but there are plenty of veg*an-friendly traditional dishes. I wonder how you would enjoy them (I have no doubt that you are professional enough to be able to cook such things), and what would you choose to write a Vegventures post about?